College of Nursing Dean-Dr. Gloria G. Florendo says in her speeach that research must be a ‘way of life’ for the students. 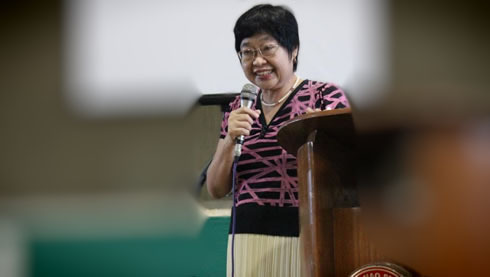 Research may be the most unpalatable menu in a student’s academic restaurant but Vice President for Research, Development and Extension (VP-RDE)- Dr. Milabel Enriquez-Ho urged student nurses to engage in research as it forms a part of the evidence-based practice of the nursing profession. This was said during the 3rd College of Nursing Research Forum held at the Dr. Juanito Bruno Gymnasium on January 27. The following faculty researches were presented during the forum: Primary Health Care Services for the Samals in the City of Zamboanga by Sarah S. Taupan, DPA; and Disaster Risk Management Capability of Front-liners of the City of Zamboanga by Rommel N. Rosaldo, DPA. For the graduate research: Fender’s Theory in the Care of Individuals with Health Risk Behaviors by Rubelle Marshah E. Ho.